Treatment of cervical dystonia in adults in order to decrease severity of abnormal head position and neck pain.Temporary improvement of moderate to severe glabellar (frown) lines in adult patients <65 yr.
Inhibits release of acetylcholine from peripheral cholinergic nerve endings, resulting chemical denervation of treated muscle. Localized reduction of muscle activity, with decreased spasticity in cervical dystonia. Decreased appearance of glabellar lines. Absorption: Minimal but may be significant in selected populations. Contraindicated in: Hypersensitivity to botulinum toxin products or additives ; Allergy to cow's-milk protein ; Infection at injection site. Use Cautiously in: Previous surgical facial alterations, marked facial asymmetry, known weakness/atrophy of muscle in question, inflammation or skin abnormality at injection site, ptosis; Peripheral motor neuropathic disorders (may exacerbate clinical effects and ↑ the risk of severe dysphagia and respiratory compromise); Hyperhydrosis (safety not established); Geriatric: Use cautiously; consider concurrent diseases and drug therapy; Obstetric: Use only if potential benefit justifies potential risk to the fetus; Pediatric: Safety and effectiveness has not been established. Concurrent use of aminoglycosides or other agents interfering with neuromuscular transmission including curare-like agents or muscle relaxants may ↑ effect.Concurrent use of anticholinergics ↑ systemic anticholinergic effects. 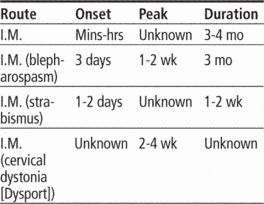 Intramuscular (Adults) 500 Units as a divided dose among affected muscles; may be repeated every 12–16 wk, based on return of symptoms (range 250 and 1000 Units). Increments may be made in 250 Unit steps according to response. Intramuscular (Adults <65 yr) 50 Units, divided in five equal aliquots of 10 Units; may be repeated every 3 mo. Assess heart rate in patients with history of heart disease. May cause a slight (3 beats per minute) reduction in heart rate 30 min following injection. Cervical Dystonia: Assess amount of spasticity prior to and following therapy. Glabellar Lines: Assess level of glabellar lines prior to and following therapy. Lab Test Considerations: May cause slight ↑ of blood glucose. The potency Units of abobotulinumtoxinA are not interchangeable with other botulinum toxin products. Intramuscular: Reconstitute each single-use 500 mg vial with 1 mL or 300 mg vial with 0.6 mL of 0.9% NaCl without preservatives. Concentration: 500 mg/mL or 250 mg/mL, respectively. Swirl gently to dissolve. Solution should be clear and colorless; do not administer solutions that are discolored or contain particulate matter. Refrigerate solution and protect from light; do not freeze. Administer into affected muscles within 4 hrs using a 23 or 25 gauge needle. Discard remaining solution. Intramuscular: Reconstitute each 300 mg vial with 2.5 mL or 1.5 mL of 0.9% NaCl without preservatives. Concentration: 10 Units/0.8 mL or 10 Units/0.5 mL, respectively. Using a 21 gauge needle, insert at a 45° angle into abobotulinumtoxinA vial and allow the vacuum to pull 0.9% NaCl into vial. Discard vial if vacuum has been lost. Gently rotate until white substance is fully dissolved; do not shake. Solution should be clear and colorless; do not administer solutions that are discolored or contain particulate matter. Solution is stable for 4 hrs if refrigerated and protected from light; do not freeze. Draw up single dose and expel any air bubbles in syringe barrel. Exchange needle for a 30 gauge needle for administration. Administer 5 equally divided aliquots of 10 Units each into 5 sites (2 in each corrugator muscle, 1 in procerus muscle). Inform patient of purpose of abotulinumtoxinA. Advise patient to read Patient Medication Guide prior to treatment. Inform patient that effects of abotulinumtoxinA may spread beyond the site of local injection. Advise patient to notify health care professional immediately if problems swallowing, speaking, or breathing occur or if signs and symptoms of spread (asthenia, generalized muscle weakness, diplopia, blurred vision, ptosis, dysphagia, dysarthria, urinary incontinence, breathing difficulties) occur. May occur hrs to wks after injection. May cause loss of strength, muscle weakness, blurred vision, or drooping eyelids. Caution patient to avoid driving and other activities requiring alertness until response to medication is known. He typically injects a medium dose of one of three neuromodulators--such as 6-10 U of onabotulinumtoxinA (Botox), 6-10 U of incobotulinumtoxinA (Xeomin) or 14-18 U of abobotulinumtoxinA (Dysport). Information for healthcare professionals: OnabotulinumtoxinA (marketed as Botox/Botox Cosmetic), AbobotulinumtoxinA (marketed as Dysport) and RimabotulinumtoxinB (marketed as Myobloc). Prospective randomised controlled trial comparing trigone-sparing versus trigone-including intradetrusor injection of abobotulinumtoxinA for refractory idiopathic detrusor overactivity. 51] AbobotulinumtoxinA is usually injected at a dose level of 500 U. The second type, abobotulinumtoxinA received approval for the same indication in 2009. Ninety patients were given injections of onabotulinumtoxinA and of abobotulinumtoxinA on either side of their faces. According to the researchers, the difference between the two agents was significant when participants contracted the muscles as much as possible, with abobotulinumtoxinA producing a greater effect. Approximately two-thirds of participants said they favored the side of their faces that was treated with abobotulinumtoxinA. DYSPORT([R]) is differentiated from other marketed botulinum toxin products with the unique name abobotulinumtoxinA. Additionally, DYSPORT(TM) is differentiated from other marketed botulinum toxin products with the unique established name abobotulinumtoxinA.